200 Blue Dolphins Baggies Small Ziplock Bags 0.5 x 0.5"
200 Apple® Brand Bags 1212 Ziplock 1/2 x 1/2 inch reclosable 2.5 MIL thickness, Blue Dolphins design. Printed on one side, other side clear. The penny is only to show the size. 200 Baggies Web Slinger design, 1010 Apple® Brand Bags 1 in by 1 in. 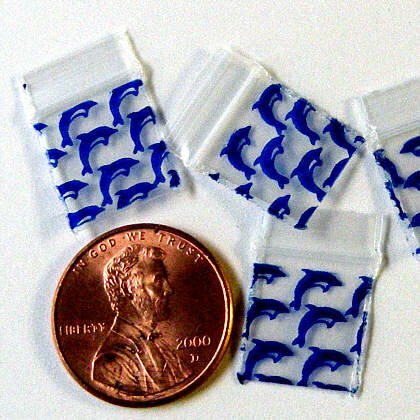 200 Biker Baggies 125125 Apple® Brand Bags 1.25 x 1.25 in.